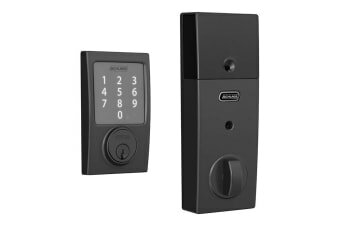 Worry less about lost or forgotten keys with the Schlage Sense Touchscreen Smartlock, which gives you the convenient option of keyless access via code. * Schlage Sense app available on iOS and Android. 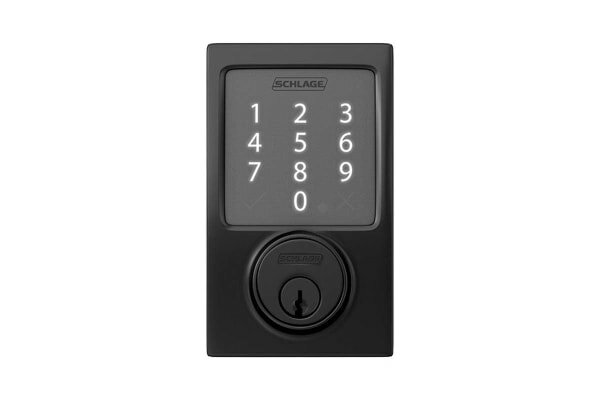 Add some simplicity into your life with the Schlage Sense Touchscreen Smartlock. Simply enter an access code into the touchscreen to unlock your door instead of keeping track of keys. Thanks to the Schlage Sense app* you can also share access codes with trusted friends and family with just a few quick taps! Unit: 4.5 x 3 x 8" | Exterior: 3 x 5 x 1" | Interior: 3 x 8 x 2"
1 3/8" to 1 3/4"; thick door kit extends 1 7/8" to 2 1/4"